Soldatino foiled a bold front-running attempt by Tom O’Brien and Barizan to take the JCB Triumph Hurdle in the closing stages and give trainer Nicky Henderson a fifth success in the four-year-olds’ championship. The winner was only bought by owner Simon Munir, through bloodstock agent Anthony Bromley, in January after a success at Pau in France. “I only bought him at the end of January and it was a job to get him entered for the Triumph because I think he was only registered in this country on the day that entries closed,” said Munir, who now has 10 horses in training and was having his first Festival success. Henderson added: “One thing that worried me was whether he had enough experience but I’m thrilled for the horse. He may be a baby but he’s tough. “You would be worried that he was only a baby and it was a long way to have to go and catch the other horse because the gap was huge. But he does stay and Anthony (Bromley) found him down in Pau in January, so he hasn’t been in England for very long and has very little mileage on the clock. He is an exciting horse. “Fair play to the second and I nearly felt sorry for him. They went such a gallop for such a long way so it was very tough for a baby to go after him. It was a long way to go on your own to catch the other horse. “He’s not been in England that long but it seemed through the winter that there wasn’t an outstanding one about and we thought we’d put him in the Adonis Hurdle to have a look. “He was very babyish and came over with a lot of equipment including earplugs, hoods and special bridles. We left them off initially but after two weeks put them back on. He had the ear plugs in today although you can’t take them out mid-race as they do in France. “We might send Super Kenny to Aintree but I doubt you’ll be seeing this fellow again this year if I have my way. “After Binocular (in the Smurfit Kappa Champion Hurdle) started things well on Tuesday, yesterday was a bit of comedown but this is fantastic. Winning jockey Barry Geraghty said: “After that bit of rain last night the ground on the hurdle track was very dead and they went very quick. “The second horse was a mile clear of us at the third last but it was too late to worry about him then, he had to come back to us. He did and I knew jumping the second last that I’d get him. They’re only young but these French horses know the ropes. “It was a good performance. The second horse went off very quick - I had to drop in and switch off - but he went so quick that he was always going to have to stop. I had the right horse and never panicked and always though I would get him. A front-running display with the hallmark of Festival folklore was snuffed out in the final 100 yards of the JCB Triumph Hurdle, the Festival’s opening race on totesport Gold Cup day. Barizan, trained near Cardiff in Wales by Evan Williams, was quickly away as the tapes rose, established a big lead and had his rivals under maximum pressure and still more than 15 lengths in arrears turning for home. From there the leader’s stride began to shorten, and as eventual winner Soldatino cut into the deficit a final-flight blunder sealed Barizan’s fate. He was passed on the run-in but plugged on to finish a gallant second. Williams was left in that awkward no-man’s land between elation at such a fine effort by his horse, and sadness at defeat. He said: “It’s disappointing to get gunned down in the final 100 yards, but the winner is obviously a very talented horse. They’ve gone a good gallop and he stretched them - I told Tom to be positive and not worry about what was going on behind. I’m delighted with the way he rode him. “I suppose if we had been more conservative we might have won, but we’ll never know the answer to that. 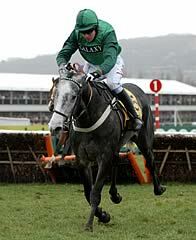 Irish handler Edward O’Grady was very satisfied with the performance of Alaivan, who stayed on to take third in the opening race on the final day of The Festival 2010, the Grade One JCB Triumph Hurdle. The Kalanisi gelding was beaten just over eight lengths and kept on well in the closing stages. O’Grady said: “He ran a great race and has reversed the form with Carlito Brigante (the 7/2 favourite who finished fourth), which we are delighted about. “I liked the way he stayed on. I thought he was going to drop back to fourth at one point but then he stayed on again. He is something to look forward to. “It was a slightly strange race and I wonder what the time was, although I agree with Luca Cumani that the only people really worried about time are behind bars!